There were no surprises with Alabama and Clemson claiming the first two spots. But things start to get fun with LSU at No. 3. LSU and Notre Dame are flipped in the AP poll, and while it’s interesting to see the Tigers ahead of the Fighting Irish, it’s likely a moot point since LSU takes on Alabama this weekend. The top five will look different next week regardless of what happens. But it’s still a positive development for the Tigers. 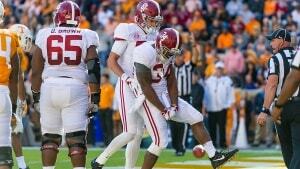 If they play Alabama competitively and lose, perhaps they won’t drop too far and can still end up in the College Football Playoff with two losses. Of course, that’s unlikely, since LSU and Alabama both play in the SEC West and a loss would almost certainly mean the Tigers wouldn’t play for the conference title. But if there’s enough attrition around them and Alabama runs over its SEC East opponent, it wouldn’t be impossible. Notre Dame’s No. 4 ranking means it controls its own destiny, but the Fighting Irish will likely have to win out in order to reach the Playoff. We knew that coming into Tuesday night. That win over No. 5 Michigan in Week 1 remains huge. The rankings look about how we expected after that until Washington State pops up at No. 8. The Cougars are ranked 10th in the AP poll. The Pac-12 isn’t dead yet. Washington State’s one loss this season came against USC by three points; the game easily could have gone either way. The Cougars could get in if they run the table and some other challengers fall. They have two more chances for big wins: the Apple Cup against Washington in the final week of the regular season, and the Pac-12 championship game. What a story Mike Leach’s squad has been this season. No. 9 Kentucky is right on Washington State’s tail, and it’s nice to see that the Wildcats’ season is getting recognized. Their defense is nasty, and their lone loss is a respectable one (at Texas A&M in overtime). Kentucky takes on No. 6 Georgia on Saturday. To say this is an important weekend in the SEC would be an understatement. Sure, it’s unlikely Kentucky beats Georgia and then goes on to run the table and beat Alabama or LSU in the SEC championship game. But if all of that happens? The Wildcats will make the College Football Playoff. And the fact that Kentucky’s Playoff hopes are alive heading into November shows how far that program has come. Another team worth highlighting is No. 12 UCF, which is one of four undefeated teams in the poll. The Knights are ranked three spots lower than in the AP poll, and they’re certainly a long shot to reach the College Football Playoff. But they’re probably the lowest-ranked team that has any chance. UCF’s strength of schedule does it no favors, and it’s going to need a ton of help. Regardless, the Knights have had a phenomenal year in the wake of Scott Frost’s departure, and they have a big game on Thursday night against Temple. That’s definitely one worth watching. The Owls are 4-0 in conference play. There are some intriguing plot lines in the bottom half of the poll, and most of them are significant because of how they may affect the top teams and how we’ll ultimately perceive them. For example, Clemson is ranked second, but the ACC is supposedly having a down year. That said, the ACC had a good night on Tuesday, relative to its AP rankings. Syracuse (No. 19), NC State (No. 21) and Boston College (No. 22) are all higher in the committee’s rankings; the Wolfpack aren’t even ranked in the AP poll. Clemson also has a win over Texas A&M, which is five spots higher in the CFP poll than it is in the AP. The Tigers have wins over three of those programs; they face BC on Nov. 10. Oklahoma benefits from this a bit, too. It notched a 10-point win over Iowa State earlier this season. The Cyclones are unranked in the AP poll but check in at No. 24 in the CFP rankings. Every top 25 win matters when you’re a fringe Playoff team like the Sooners. As previously mentioned, these rankings are fluid. But the first week is always interesting to get a sense of where the committee’s collective heads are at regarding certain teams. We got some meaningful answers on Tuesday night.